When our pastor asked us to look up John 20:1-10 at church this morning, our son, Ethan, quickly opened up a Bible app. As the pastor read, Ethan found it interesting that Jesus’ face cloth was folded. I thought about that and brought it up to my husband, John, later. We both thought the cloth must have been folded to assure his disciples that His body wasn’t taken. And we’re not alone in thinking that. I looked up John 20:6-7 in an NIV Study Bible and two Bible commentaries and they had the same thought. Jesus’ folded face cloth might have additional meaning. Maybe that’s something we’ll find out in Heaven, the place where victorious Jesus LIVES. He defeated death! He is risen! I once heard someone say we should be extra nice to people since we don’t know what’s going on in their lives. I agree. I recently saw a woman in a pain medication aisle under the sign, “Pain.” She was lingering and holding a large bottle of what looked like Tylenol. I may never see that woman again, but if that pain medicine was for her, she had some physical pain. It’s possible she had some emotional pain too. Let’s say the woman was buying Tylenol for a headache after intense crying over losing a loved one. As she was driving home, someone behind her in traffic impatiently decided to lay on the horn because she didn’t go immediately after the light turned green. Having not had a chance to have the Tylenol yet, her headache gets worse and in her sensitive state, this is too much and she goes home and cries some more. The advice to be extra nice to people is Biblically based. In 1 Thessalonians 5:11, we’re encouraged to encourage others. How can you encourage someone? When I searched the word, “pray” on biblegateway.com, there were 367 hits for NIV and 508 hits for KJV. With hundreds of hits, we can understand that praying to God is very important. According to www.livestrong.com, our bodies have 600+ skeletal muscles! In searching for the number of skeletal muscles in the human body, I discovered that some scientists think we have more than 800 https://www.loc.gov/rr/scitech/mysteries/muscles.html. On a frigid day I was listening to a Christian radio station when another radio station came into the background. There was a song on one station and some sort of ad on the other station. The static started to give me a headache. Has that ever happened to you? Let’s pretend that us listening to simultaneous radio stations is like God listening to simultaneous multiple prayers. There’s a big difference though. If we’re listening to two different radio stations, we may not catch all of the information. Add eight more radio stations for a total of 10 simultaneous radio stations, and I’m pretty sure nobody could decipher all of the input. It’s reassuring to know that God clearly hears everything He wants to hear. If He decided to listen to all of the world’s radio stations, He could. He could also easily keep listening to all of our prayers without getting a headache. God is the ultimate multitasker! One morning I was in bed and it was so quiet I could hear a bedroom clock ticking. The ticking made me think about a heartbeat and about how Schoolhouse Rock sang about our bodies being like machines. Indeed, God made us work like well-oiled machines. A baby’s heartbeat begins approximately 22 days after conception and our hearts beat throughout our lives until we die. How many machines have you had that work that long? Just as Psalm 139:14 says, we are definitely, “wonderfully made”! In Leviticus, God gave the Israelites a message to “Be holy.” Psalm 119:11 is about not sinning against God which would be holy behavior. It is my prayer that we can all strive to be holy too. 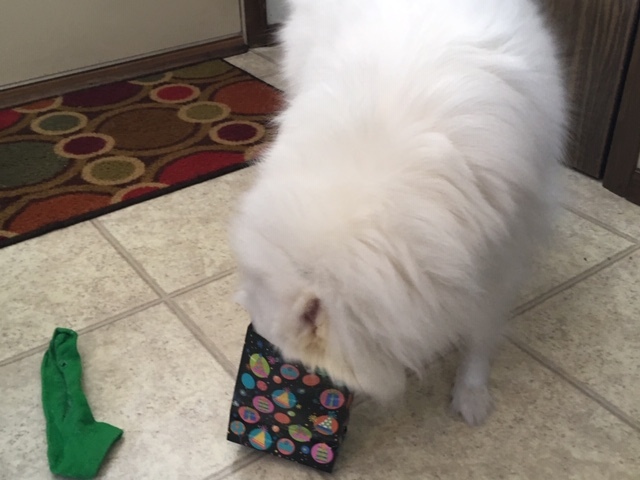 Our “Toy” American Eskimo dog, Ezzo, who grew much bigger than we expected, had his golden birthday last week. 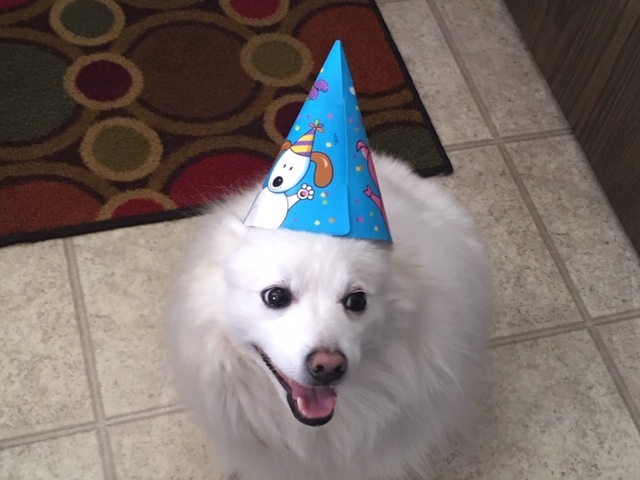 He doesn’t need a birthday to be happy though. He often looks more than content. Picture him playfully “nosing” a snowdrift, happily catching a donut-flavored piece of cereal tossed from one of our kids at the kitchen table, and later energetically playing tug-of-war with his green, and then elongated sock. In 1 Timothy 6:8, it’s about being content with food and clothes. Ezzo seems content with just food. One winter he acted like he couldn’t move when we put a sweater on him. Some people seem discontent. Discontented people might be upset if someone suggested they learn contentedness from canines, but I can’t help but think God wanted us to notice contentedness in His creation. Paul wrote glowing words in Philippians 2:19-24 about Timothy. He basically said he was one of a kind because he really cared for others. Have you heard the song, “No Longer Slaves” by Bethel Music? My family loves this song. Some of the lyrics are: “I’ve been born again, into a family…I am a child of God.” So what should a child of God be like? A child of God should receive and believe Him, being one who doesn’t complain or argue, but is a peacemaker. In Life Science, my son, Ethan, learned that King Cobra snakes eat other snakes. That made me think of the snake God instantly created for Moses’ and Aaron’s presentation to Pharaoh in Egypt. When God first instructed Moses to thrown down his staff and it turned into a snake, Moses ran away. I think he ran because he recognized it as a venomous snake. Later, before Pharaoh, Aaron was the one to throw the staff down which God turned into a snake that ate Pharaoh’s snakes. One question I have is what was the staff’s size? According to apologeticspress.org, there were varying sizes of staffs and Aaron’s staff length isn’t known. Another question is what kind of snake-eating snake was it? The KJV says, “serpent” and NIV says, “snake.” Curious about venomous Egyptian snakes, I visited http://www.worldatlas.com where nine venomous Egyptian snakes were listed. I read about all of them and now wonder if it could have been a Saw-scaled viper or a Red spitting cobra. If Moses’/Aaron’s staff was about 4 ft., Maybe God decided it should become a Red spitting cobra. But, God is God, so He could use whatever size of staff to turn into whatever kind of snake, including an 18 ft. King Cobra (www.nationalgeographic.com) or whatever snake He chose.